On a sweltering day in late June this year, a park and garden in northeast Detroit was buzzing with activity. 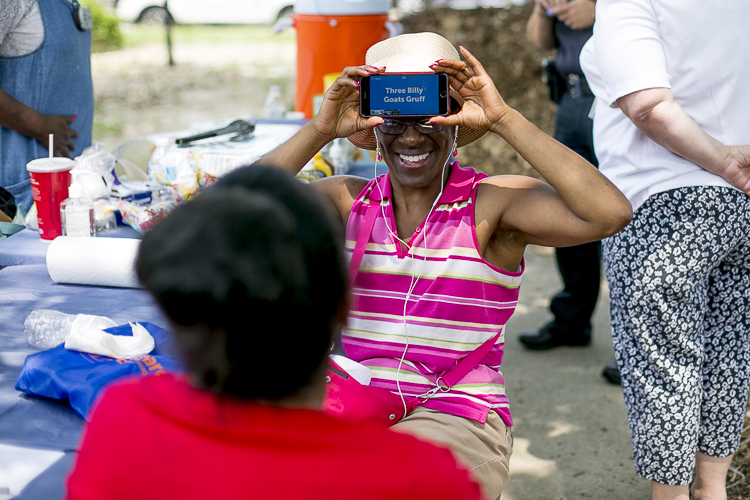 Residents of Yorkshire Woods, a tiny neighborhood near I-94 and Whittier Avenue, gathered for a barbecue and to enjoy the fruits of their labor. The lots on which the residents gathered once had decaying houses and litter. Today, there's a little farm, 4 Angels Community Garden, with raised beds, a stage, and dozens of painted tree stumps for stools. A rain garden is halfway completed, with plans for more green space across Kensington Street. Also on that hot day, volunteers with Elite Detroit were preparing a fence on one side of the garden for a mural. Police officers from the local precinct stopped by to listen to the music and converse with residents. This kind of community gathering has not been uncommon to the area in recent years. That's thanks largely to Mose Primus, president of the Yorkshire Woods Community Organization. A tireless advocate for his little community, he's evidence that dogged efforts at a grassroots level can work little wonders of revitalization. Yorkshire Woods' story is similar to many other Detroit neighborhoods. At one time dense and filled with middle-class families, years of steady population loss followed by the housing crash, recession, and tax foreclosure crisis devastated the neighborhood. Vacant houses and lots dot every block. Barbara Alexander Jones has lived in the neighborhood for over 30 years and watched the entire saga unfold. A retired Detroit Public School teacher, she remembers when Yorkshire Woods was a vibrant community. She also remembers when her neighbors, who bought their house five years before she did, lost it because they couldn't pay their mortgage. But lately there have been signs of hope again. Why? "Mose Primus," Jones says. "When he's in something, he gives it 110 percent. He doesn't know when he gets tired. "He's just such a go-getter," she adds. "Everywhere he goes he talks about Yorkshire Woods and what we need." Primus has deep roots in Detroit. His father was the first African-American butcher in Eastern Market, and Primus worked for him for 27 years. The Yorkshire Woods Community Organization (YWCO) predates Primus (it was founded in 1975), but by the time he moved there almost 20 years ago, it wasn't doing much effective work. "They went through several presidents and board member changes," Primus says. "Essentially, it had become a place to come and vent." Jones says that was due in part to the general feeling of despair in the community, especially by the time the recession hit. "Everyone got discouraged because we couldn't get people to participate." Primus became president of the YWCO in 2014 — and he doesn't really get discouraged. Primus' work consists of numerous little steps that add up to much more. Eyeing the land on Kensington Avenue near King Richard Street, he saw it as a place to beautify. To get ownership of the vacant land, YWCO successfully became a District 4 Community Partner with the Detroit Land Bank Authority, securing all six lots. He then got the district manager to help with demolition, but decided to save the garage of one house. With A $500 Boot Blight Camp grant, the organization turned it into a shared tool shed with rainwater barrels. Last year, Wayne Metro Community Action Agency gave YWCO a $2,500 grant to build the stage and fence. Thanks to technical assistance and a $6,500 grant from Detroit Future City, they're building a rain garden, called Yorkshire in Bloom, complete with maple trees, roses, and a gazebo made out of reused doors. They recently purchased another six lots across the street, thanks to a donation, where they hope to build a fitness park with maybe a volleyball or basketball court. Primus hasn't secured the funding for those projects yet, but given his success so far, who would doubt him. "We're doing a lot of smaller projects that are starting to come to life. I'm very happy with where we're at," Primus says. "But I also know that the blight and 'I don't care' attitude didn't happen overnight. To turn that around is not going to happen overnight either." In addition to securing funds and donations, Primus, a self-described "people person," is adept at getting people to volunteer. In 2015, he got over 100 youth volunteers for a neighborhood cleanup when the Lutheran Church send a massive delegation to Detroit. In one house, they found and disposed of over 150 tires — an absurd number even for a neighborhood that had been victimized by illegal dumping. YWCO regularly holds cleanups, paintings, plantings, and other volunteer opportunities from which Primus taps into his deep reserves of connections with locals and other organizations, such as The Detroit Institute of Arts, the Michigan Department of Corrections, Northville Stands with Detroit, and more. He was even nominated for and received The President's Volunteer Service Award. The next year, he helped secure one for every other member of the YWCO board. "It's not about me," he says. "It's about the people in this neighborhood." Beyond his neighbors, Primus is moved to work by the memory of his mother. "I'm very passionate about it. Sometimes I get emotional," he says. "Before she passed, we had a conversation. I said, 'Mama, I'm gonna put a fish pond in the yard with a waterfall.' She said, 'Well can you eat the fish?' I told her, 'No. They'll be pretty fish.' She said, 'You need to feed yourself. You need a garden.' So now that we have food growing, every time go there, I have conversation with my mother. "Mama, I got a garden and now I'm putting in your flowers."